The number one question we as REALTORS are asked is, “How is the market”? We as a profession are asked this during working hours, at social functions, at our kids’ school functions, while walking our dogs, while doing yard work, and any other time anyone finds out we sell real estate. At times, the question is very difficult to answer and can be swayed by our personal business and is not necessarily indicative of the market as a whole. 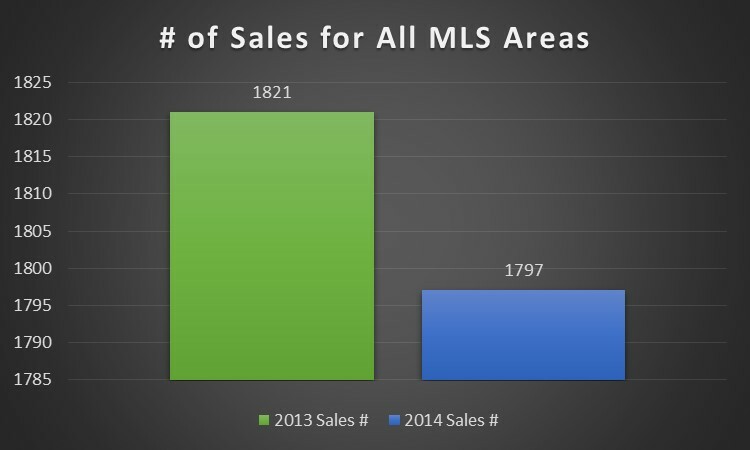 So here are the actual market statistics taken from the Longview Area Association of Realtors MLS data. This data is from for the first 3 quarters of the year – and the comparison data is for the same period in 2013. The first market data we use is the actual number of properties sold during the first 3 quarters of the year. 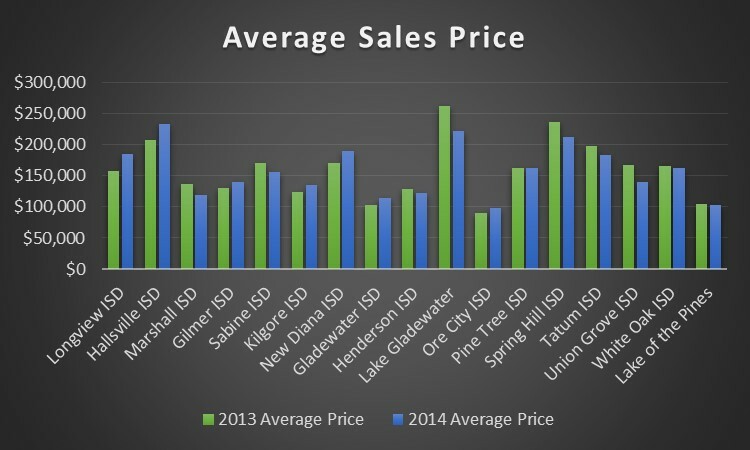 We look at specific market areas such as Longview ISD, Pine Tree ISD, White Oak ISD, etc. 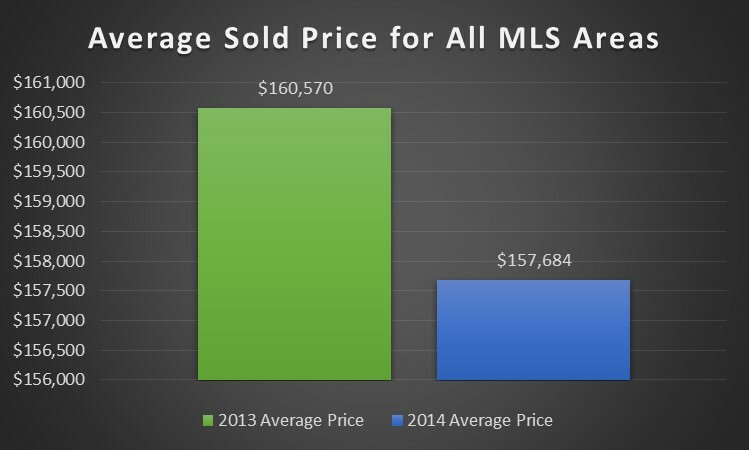 We also look at the MLS as a whole. In the overall scheme of things, a decrease of 24 homes is a small percentage of our market as a whole. Another indicator we study is total sales volume which is the total value of all the homes sold. 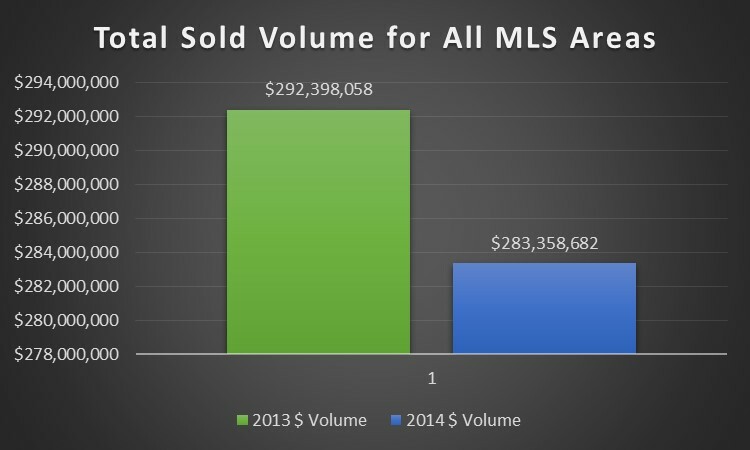 The overall MLS sales volume has decreased approximately $9 million. Longview ISD’s sales volume has increased approximately $12 million. Hallsville ISD’s sales volume increase by approximately $1.7 million. Pine Tree ISD’s sales volume has decreased by approximately $2 million. Spring Hill ISD’s sales volume has decreased by approximately $6 million. 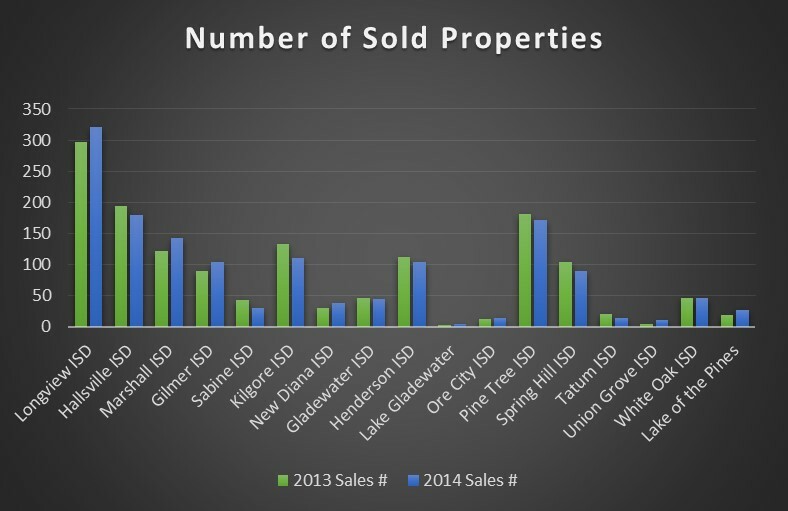 White Oak ISD’s sales volume has remained virtually the same. 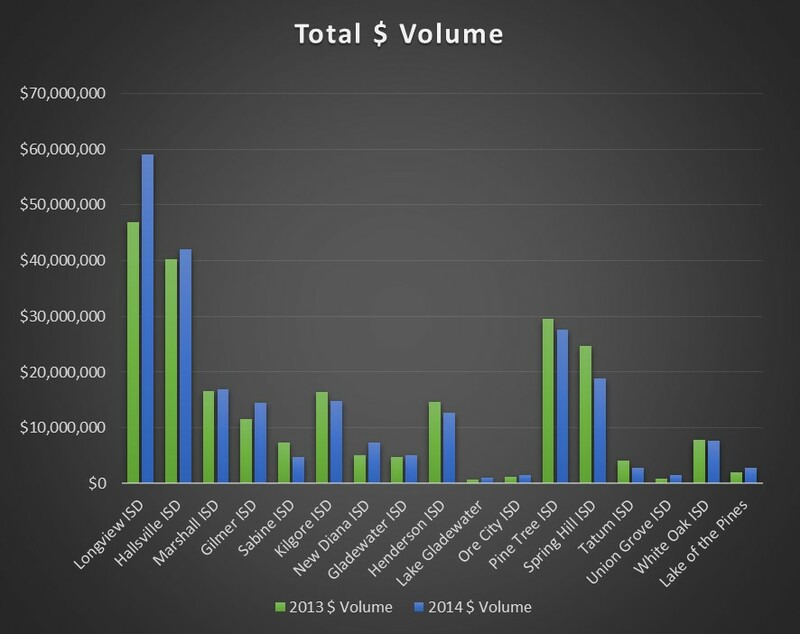 Once again, the overall decrease in sales volume is a small percentage of our overall market. Once we have the total number of homes sold and the total dollar volume, we can figure the average sales price which is what most people are interested in hearing about. Longview ISD has seen an increase in average sales price of approximately $26,000. Hallsville ISD has seen an increase of approximately $25,700. Pine Tree ISD has seen a slight decrease of approximately $1,000. Spring Hill ISD has seen a decrease of approximately $24,000. White Oak ISD has seen a slight decrease of $3,000. As you can see, the overall values in our area are stable. However, specific areas can either be increasing or decreasing depending on supply and demand for that particular market area. There are currently 1,733 active listings in our MLS with a value of $391,950,686. This calculates to an average asking price of $226,169. There are 221 active listings in Longview ISD with a value of $57,861,386. This calculates to an average asking price of $261,816. There are 109 active listings in Hallsville ISD with a value of $32,795,349. This calculates to an average asking price of $300,874. There are 139 active listings in Pine Tree ISD with a value of $28,032,410. Pine Tree’s average asking price is $201,672. There are 65 active listings in Spring Hill ISD with a value of $21,809,925. Spring Hill’s average asking price is $335,537. There are 23 active listings in White Oak ISD with a value of $5,536,250. White Oak’s average asking price calculates to $240,707. So as you can see from all the information above, there is not an easy answer to, “How is the market”. There are so many variables that come into play depending on location, price, condition, and other factors that the “market” can be significantly different for individual sellers and buyers. So you will excuse your area REALTOR when they respond to the market question with a resounding “It is great” because really, most of our acquaintances really are just making small talk and don’t want to spend the next 4 hours listening to us go into a detailed analysis of the market! 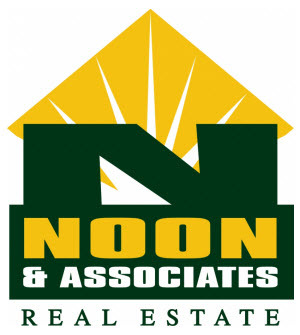 However, when you are ready to buy or sell, the professionals at Noon & Associates are experts on local market conditions and are here to help guide you through “the market”. Call us today – we are here to help! This entry was posted on Monday, October 6th, 2014 at 10:14 pm	and is filed under General, Tips for Buyers, Tips for Sellers. You can follow any responses to this entry through the RSS 2.0 feed. You can leave a response, or trackback from your own site. Great information! 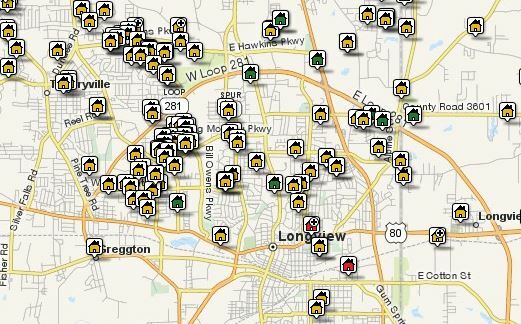 It is nice to know what is going on in the various areas of Longview.